How can you get better at hand-lettering, or any creative discipline? Pay hundreds of dollars on posh classes and fancy supplies? NO WAY!! Practice for a short time each day! 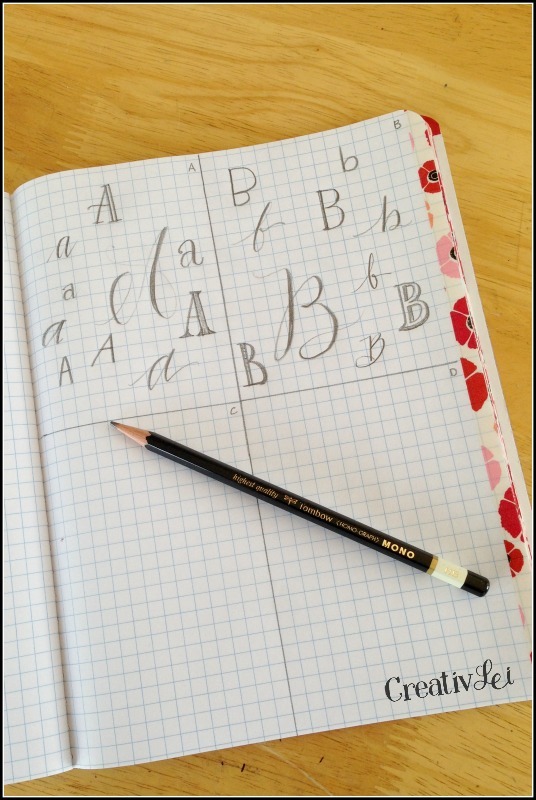 Penmanship drills are a great way to build consistency, but often we want to have a little more fun with our practice. You’ve asked me how I’ve grown more confident in my lettering and art, and I tell you that I’m still working on it! In fact, I’m scribbling out doodles and drawing alphabets on most of the scrap papers within my reach! Daily challenges are a hit on Instagram. Instagram challenges can be addictive, but the real draw is that that fun approach to accountability is actually helping us stretch and grow our skills! We’re also building community as we connect and learn new tips and pointers from others that participate. After months of requests for a daily challenge to follow-up #loveYOURlettering, I’ve finally brainstormed some monthly themes for us to practice through, together! You don’t need to carve out hours of quiet time to stretch your creative muscles. I want to show you that just fifteen minutes a day can really grow your skills! No fancy supplies needed, use what you have on hand, whether that’s a pen, pencil, marker, or calligraphy pen. I’m using a 3″ note pad I found at IKEA and a few of my favorite writing utensils, a Tombow Fudenosuke(soft), a pigment fineliner, and a mechanical pencil. For fifteen minutes each day I’ll draw out one letter in various styles, on a single sheet of the notepad. No erasing, no measuring, no planning, just drawing out different styled letters. It’s not time to worry about perfection, instead we’re perfecting on progressing. Just get in the habit of daily practice. If you don’t already have a notepad you’d like to use (I know you’re probably still hoarding a few One Spot notepads… What, I’m the only one? 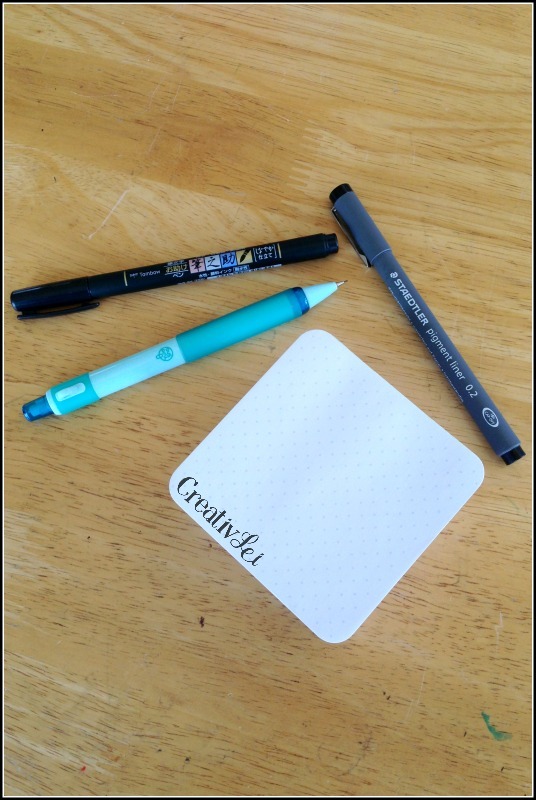 ), why not split the back pages of your #loveYOURlettering notebook into grids and use that? So will you join us for June? Here is a graphic of our prompts for the #justaletteraday theme. I don’t have a schedule, yet, but I’ll demonstrate some of my practice on Periscope or Facebook Live during the month. If this challenge gets a good response, I’ve already brainstormed a list of themes for the coming months. 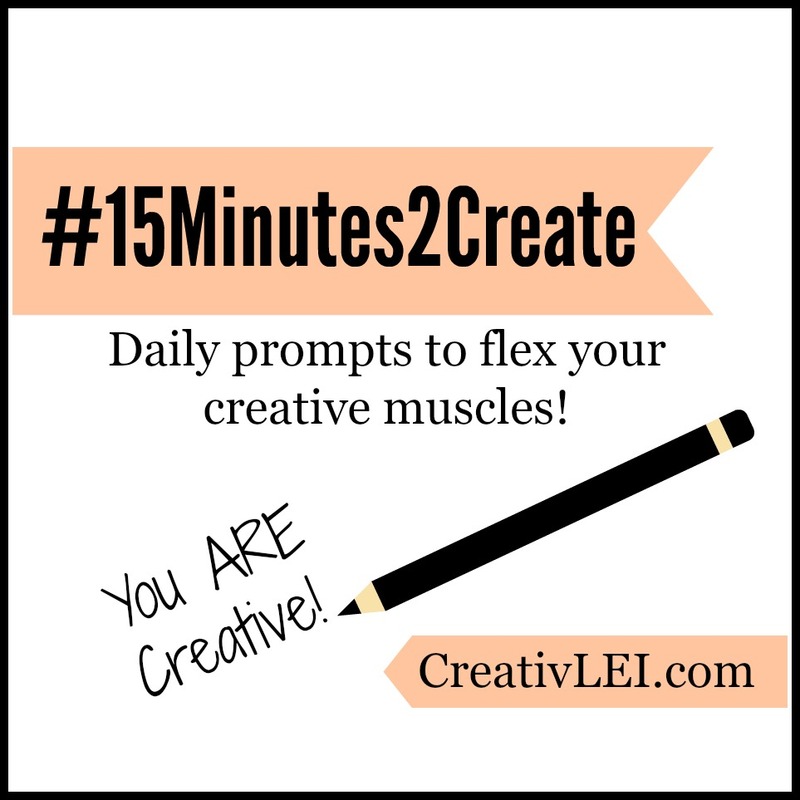 How can you participate in #15Minutes2Create? There are very few rules. Seriously! No, you don’t have to sign up for my emails (but if you’re on my monthly newsletter list, you’ll see updates for new challenges and more), you don’t have to buy special supplies, I don’t require you to follow me on Instagram, Periscope, or Facebook (but if you do, you’ll see my practice pages). Just use these prompts for your own fun! 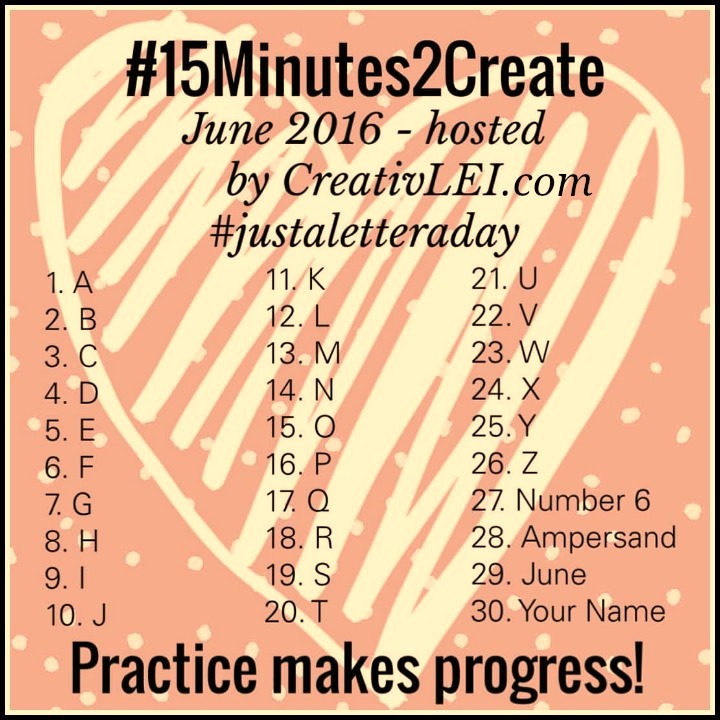 If you use the hashtags #15minutes2create and #justaletteraday, the rest of us can follow your progress and cheer you on! If you’re not on Instagram and want to share your work as accountability, feel free to post on the Facebook page. If social media isn’t your thing, just comment here that you’re following along! You can even post your progress in the comments. I’m looking forward to this month of practicing each letter (plus a few bonus items that I use frequently in my lettering).